Developed from the Ikara anti-submarine missile, the Turana was a world class technological advanced drone, designed and built in Australia. 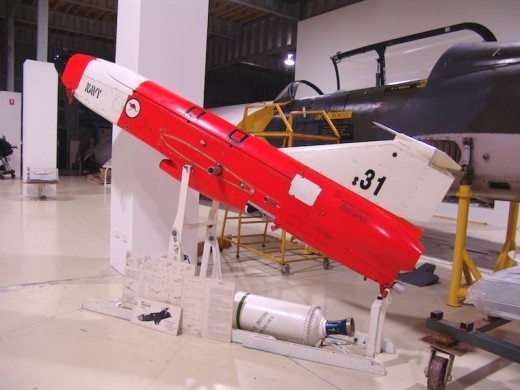 It was intended to provide a remote control, parachute recoverable pilotless target for use in gunnery and missile defence training and practice by the Royal Australian Navy (RAN). 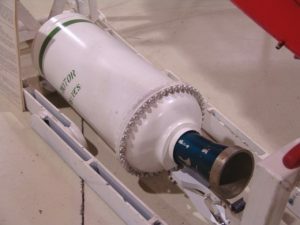 It was powered by a small gas turbine Microturbo 022-01 Cougar jet engine of ~80 kg thrust with a detachable solid booster rocket for launch from a warship’s Ikara missile launcher. It’s first flight was in early August 1971 from the Woomera Rocket Range with the first ship launch from the HMAS Swan in January 1974. Initial speed peaked at ~650 km/h when the launch rocket detached with remote control effective from 200 ft up to 20,000 ft altitude. A total production run including prototypes was some 23 missiles built in the early 1970s by the Government Aircraft Factories (GAF) in Victoria. In 1971, the RAN ordered twelve Turana targets at a cost of $1.183 million from GAF, despite the fact that trials had not yet been completed. The Turana project was subsequently cancelled by the Federal Government in September 1979. Our Turana is Serial #22 and was one of the last off the production line. It was kindly donated to HARS by our Tour Guide Mr Glenn Owens.